My husband and I have been joking, dreaming, and just talking about starting a sheep farm for a long, long time. It is just recently that we've thought our fiber farming aspirations could become a reality. I guess the joking and just dreaming initially stopped when we watched a great video by MVKnits on Etsy's Blog about her sheep farm experience. It was extremely inspiring and made me and my husband think that we might really be able to sustain ourselves as sheep farmers. Since then, we've talked about it a lot, checked out many library books on the subject, and surfed the web for any information that we could find. We're in the process of researching what all is involved in owning and maintaining a successful small sheep farm. I know that there is nothing like experiencing something, but for now, we'll continue learning as much as we can through all the resources that we find. 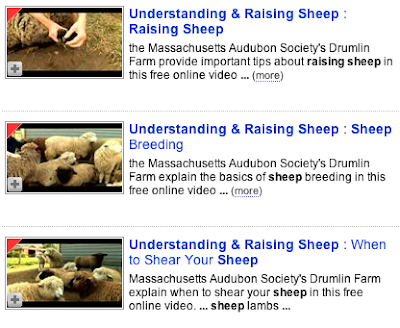 Yesterday I came across a great video series called Understanding & Raising Sheep on YouTube. It was originally from the website ExpertVillage.com which has some interesting instructional videos. This particular series includes very short clips on the basics of sheep. It is presented by a naturalist from the Massachusetts Audubon Society's Drumlin Farm. Each short video is only a few minutes long, but they are very informative and interesting if you are a novice to sheep and sheep farming. Oh, and they also have the most adorable sheep! It is worth watching a few video clips just for that. **I, the funky felter, am not affiliated nor do I endorse the above resource information. I'm just sharing some nifty info and cute, fuzzy sheep.